(NORTHRIDGE, Calif., Oct 28, 2016) — The annual Latin American Film and Art Festival in the Armer Theater at California State University Northridge takes place Friday Nov. 18 through Monday Nov. 21. 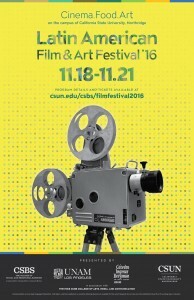 CSUN’s Department of Cinema and Television Arts is partnering with the College of Social and Behavioral Sciences and Universidad Nacional Autónoma de México en Los Ángeles (UNAM-L.A.) to present the festival. The festival will feature the artistic contributions of regions that stretch from the southern tip of Latin America to Mexico. This year’s festival will highlight films from Brazil, as well as films from other Latin American countries. The Cuban film, “El Acompañante” and the Colombian film, “Alias Maria” were selected for Oscar considerations. On Friday Nov. 18 there will be an opening reception at 6 p.m. The festival will show the Mexican children’s film, “The Incredible Story Of Stone Boy,” Sunday at 2:30 p.m. The festival activities will take place in Manzanita Hall, near the southwest part of the campus at 18111 Nordhoff St. in Northridge. Parking at CSUN is $8. Permits can be purchased at information booths located near the perimeter of campus on Lindley Avenue to the south or on Prairie Street to the West. Parking permit dispensers can also be found in student parking lots around the campus. For more information about the festival, visit its website.